A stainless steel plunger moves vertically when the pig makes contact; when the pig passes, the plunger returns to normal position ready for next contact. A stainless steel hinged rod is deflected by the pig and folds into a special recess until the pig passes and the rod returns to the ready position. Both models actuate the micro-switch to indicate arrival and/or passage of the pig/shut down the station till the pig has passed/resumed pumping. Available for any size line. 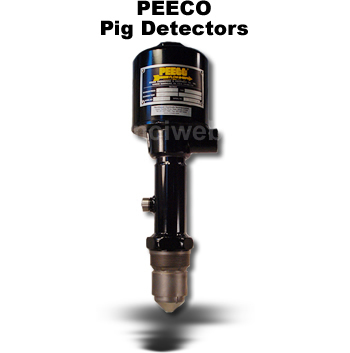 Available with visual indicator as to direction and passage of the pig -- with manual reset button option.